Experience the spectacular sight of the 800 years old bronze Great Buddha Statue at Kotoku-in on this exciting day adventure. Other sites that will be visited are Meigetsu-in Zen Temple, Kenchō-ji Temple, Lunch at Komachidori (shopping and lunch area), Engaku-ji, Tsurugaoka Hachimangū Shinto Shrine and finally Hase-dera. There are more possible configurations to this tour and it is flexible based on your interests. During this tour, you will also have the opportunity to have beautiful photos taken of you while being guided on a private tour. 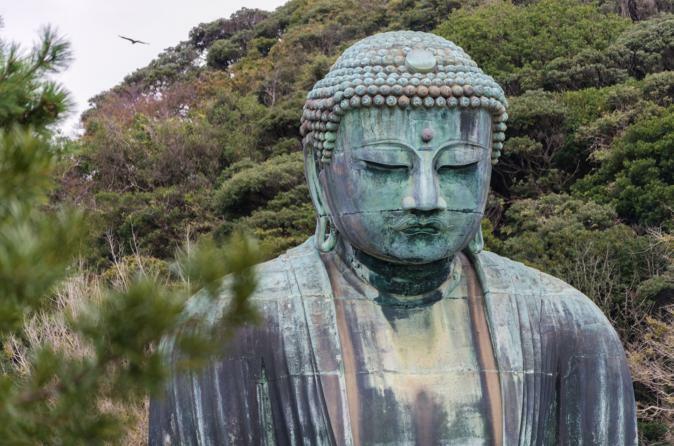 Tour will visit Great Buddha Statue at Kotoku-in, Meigetsu-in Zen Temple, Kenchō-ji Temple, Lunch at Komachidori (shopping and lunch area), Engaku-ji, Tsurugaoka Hachimangū Shinto Shrine and finally Hase-dera. There are more possible configurations to this tour and it is flexible based on your interests. As with other tours, this runs a total of 9 hours (approx) from 9 am (pick up time) – 6 pm (drop off time) with pickup and drop off; from/to your Hotel or any place in the Tokyo Metro Area. However, plan on a complementary 8 am pick up time from your hotel to get a good head start on the day!